Imagine an alternate universe where Jonathan Richman is kidnapped by a band of Polish klezmer musicians. * He escapes and returns to the USA to write and record music with that unique Jonathan relationship to rhyming and rhythm and pitch. 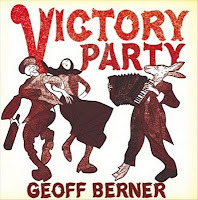 Of course he had to change his name to avoid recapture by the dastardly klezmorim, so he now calls himself "Geoff Berner." That's as plausible an explanation as any for the craziness bubbling from a new CD called Victory Party, out on Mint Records on March 8 -- a circus-punk sideshow, with Socalled (Josh Dolgin) serving as ringmaster/producer for the dark, twisted tales within. You'll meet "Laughing Jackie the Pimp" and the "Wealthy Poet" and a unique, disobedient Golem. You'll also get conflicting opinions about the police: In "Jail" Diona Davies sings (again with a rather casual approach to pitch) about wanting to go to jail to get free shoes and hot meals. But in "Daloy Polizei" (based on a true story) the police are sinister and untrustworthy. Though they are cleared by an internal investigation, of course. I'll share this song here, because due to the lyrics, it ain't going on the radio. Berner's circus is on tour this spring in Canada and Europe. *On second thought, he may just be the secret love child of David Krakauer and They Might Be Giants. I'll have to look into this.